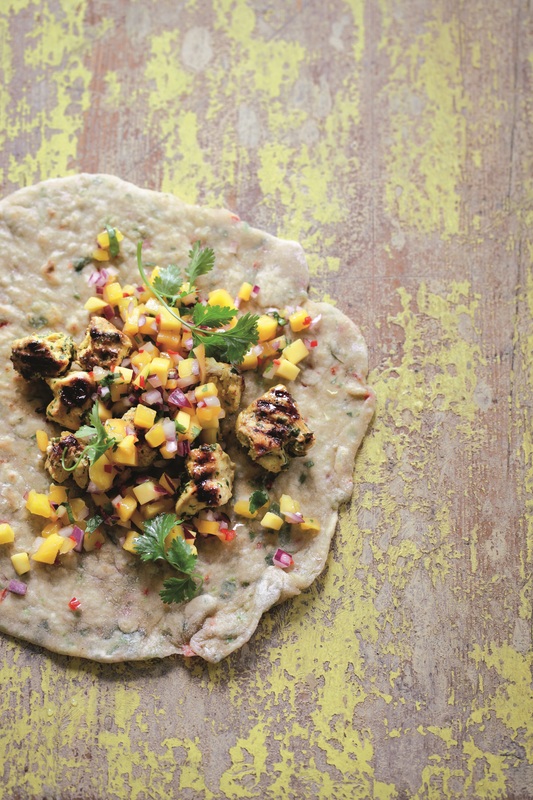 This thick roti is ideal for things like meat skewers, shawarma, tandoori etc. Makes 4 x 22 cm wrappers. Combine all the ingredients except for the extra fat to make a soft and supple dough. You can do this by hand, or in a mixer fitted with a dough hook. A food processor fitted with a kneading attachment makes really quick work of it. Shape the dough into a ball and put it in a bowl. Cover with clingfilm and leave to rest for 30 to 60 minutes. Re-knead lightly and divide into 4 balls. Roll out each ball to a circle about 22-24 cm in diameter, dusting with flour as necessary on both sides. Heat the tawa or dry frying pan. When the pan is hot, reduce the heat. Slap a roti onto it; it will shrink a little. Let it cook until there are a few bubbles on the top. Flip the roti over and allow the other side to cook briefly. Brush with ghee or rub with the knob of butter on both sides and keep wrapped in a tea towel until ready to eat. Cook the remaining roti in the same way.